I'm VJing at the Big Chill House for Nice Up! which means I get a comfy seat to hear Benny Page & JStar DJ. And if that's not enough, my temporary structured compadres, The Disco Shed, are taking over the top room too! What a night it's going to be! Another bumper line up on a Friday night, this time the NICE UP! 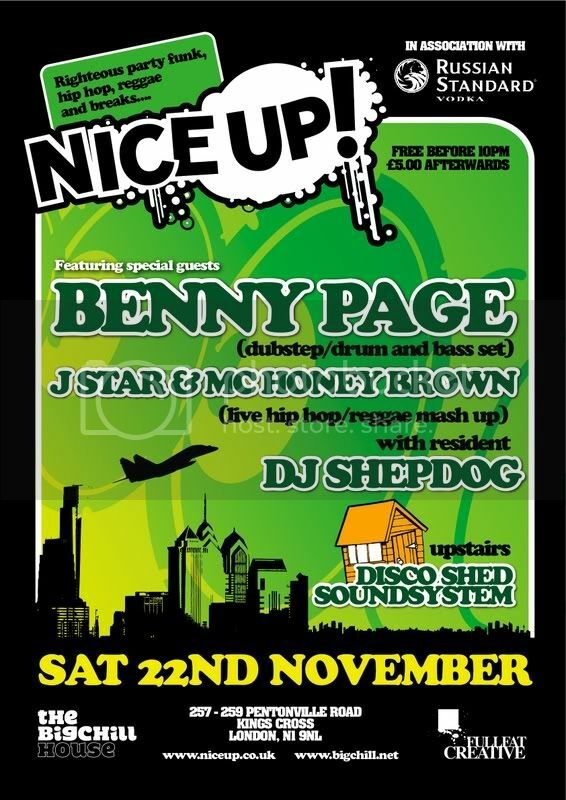 crew invite drum and bass/dubstep hero Benny Page to come and blow the joint. After a series of reggae tinged drum and bass monsters, he has slowly been building his rep as one of the toughest new producers on the scene, as well as dipping his toe into dubstep. Joining him, alongside resident DJ Shepdog is reggae/hip hop mash up don Jstar and his crowd hyping sidekick MC Honey Brown. Never ones to play it safe, they always NICE UP! the dance good and proper. Upstairs, festival favourites The Disco Shed Soundsystem bring their unique brand of shedonistic disco, funk, singalong classics and perhaps the odd garden gnome or 2. Just the recipe for getting shedded!